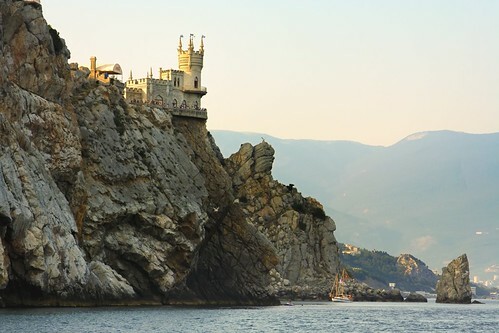 Swallow's Nest is a mini castle (20 metre x 10 metre wide) on the Crimean shore, near Yalta, Ukraine. 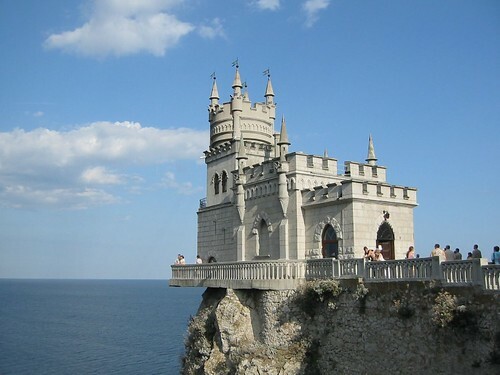 Built on a 40 metre high Aurora's Cliff, it overlooks cape Ai–Todor in the Black Sea and is very popular tourist attraction. The location originally had a wooden cottage built around 1895. In 1911 a Baltic German noble acquired the timber cottage and replaced it with the present castle. In 1927 the cliff developed a huge crack due to 6 to 7 Richter scale earthquake, however the castle was not damaged but it was closed to public. For next 40 years it remained closed and in 1968-69 it was opened to public after renovation and restoration. An Italian restaurant now operates within the building.